As a property manager, you may not always prioritize lobby safety since it is one of the most public areas on property. However, this also makes it the most accessible. This creates some essential security needs. See what you may be overlooking. In both commercial and residential buildings, a lobby acts as the transition from the public zone to the private zone. A lobby can also act as a buffer, establishing security for the people working and living in the private zone. It should be a welcoming place, but it should also be an effective function of security and access control. Overall, a lobby should convey both safety and comfort. With the right preparation, a lobby can set the tone of life safety and security for the rest of your property. Lobby receptionists should have a clear, unobstructed view of the front door or entranceway. The visitor waiting area should be located off to the side and away from the receptionist view of the entrance. 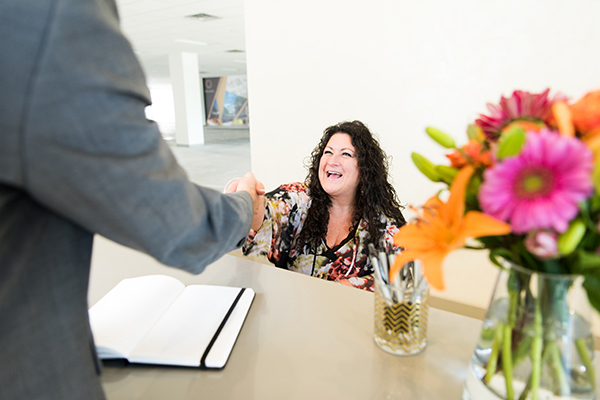 The reception desk should be constructed high and wide so that no one can easily reach across the desk to make physical contact with the receptionist. Keyless entry is becoming the access norm for all types of lobbies. This system can be distributed in the form of cards, keychain FOBs and smartphone apps, and they can be reprogrammed and reconfigured when needed. Many of these systems include security cameras that can keep a visitor log, including timestamps. Residents, tenants and property management can often control visitor access from their smartphones and can receive real-time notifications of visitor comings and goings. There should be nothing in the lobby that can be used as a weapon, such as a heavy vase or umbrella stand. Doors should be opened only by an approved electronic pass, or by a hidden button under the reception desk. Elevators and stairs that appear before a reception desk may give the visitor the impression that he or she doesn’t need to first check in and register his or her visit. Your lobby should funnel all visitors in the direction of the reception desk or check-in area with no option to forego that important step. Make sure your lights operate on timers so that they can turn on before people arrive and stay on if people are working or staying late. Include a backup lighting system that can operate in the event of a power outage or other emergency. Avoid placing trash receptacles and mailboxes in lobbies, as they can serve as a hiding place for destructive apparatus. Employees, for instance, should have a separate entrance from visitors, with separate access control. Visitors should require an additional process for being admitted into the building. One example: video intercoms that require visitors to be identified, logged by arrival and departure, and to give a reason for their visit. It’s a sad fact of life that the possibility of active shooters accessing buildings is increasing. All personnel should be trained in and aware of procedures for the (hopefully unlikely) event of violent, dangerous intruders. Learn more on how you can prepare for an active shooter. 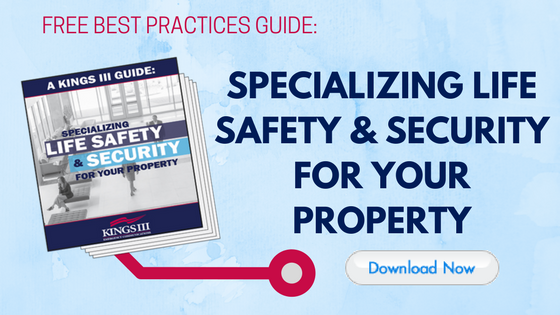 If your property is not on a 24/7 operating schedule, create a checklist to be used by those who are the first to arrive or the last to leave. Be sure that they know how to safely open and close the space. Post emergency phone numbers and contacts. Everyone should know who to contact in case of trouble. Keep this list next to every phone, on speed dial and in common areas. Ask employees and tenants to load these contacts into their personal smartphones. Make sure the lobby is slip resistant. Wet conditions outside can cause accidents (and possible lawsuits) inside. Make sure the lobby has slip resistant tracking, especially during inclement weather. These rubberized strips can stop slips and falls in their tracks. They are often available in multiple sizes and colors, including clear and do not need any screw fasteners. This option, complete with wall-mount bracket, can alert others on the property if there is trouble at the reception desk or in the lobby. Kings III offers a steady-on locator beacon and flashing blue strobe light. Click here to find out more. Having actual people on watch in the lobby can act as a crime deterrent, but not all security staff are trained the same way in how to respond to crime. They can also be an expensive budget item, usually billed at hourly rates. One costly but effective alternative: video monitoring. Determine if video monitoring is the right option for your lobby. There are blind spots that video cameras cannot see. Video surveillance is often used as a reactive rather than a proactive measure- it is not typically going to lessen an emergency that is in process. Emergency phone systems are required by law in elevators, but these are not always easily accessible from the lobby. In the event of an emergency, tenants of your building should be able to find a nearby means to help. An emergency help phone near your lobby can save lives and prevent crime by contacting authorities faster than a phone app or smartphone (click here to read why). An emergency phone is programmed to directly access help without the risk of bad reception or a dropped call. Professionals can also provide medical help until medics arrive, helping to save lives and alleviate panic. Make sure that your tenants know where all emergency phones on the property are located and are aware of the benefits associated with using one, perhaps by providing signage in the lobby. To learn more about how Kings III can assist in upgrading safety measures in your lobby as well as on your entire property, visit www.kingsiii.com.